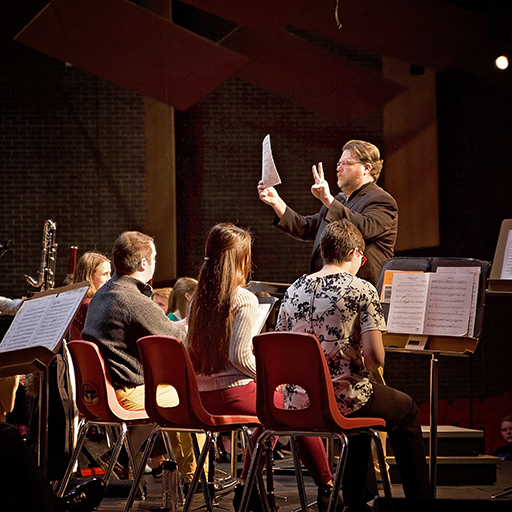 SALEM, Ind.—As the IU Symphonic Band geared up for performance at Salem Middle School, hundreds of students filed into the auditorium for a break from their school-day routine. The Jacobs School of Music ensemble kicked off the matinee program with Richard Wagner’s “Homage March,” a breezy military work with lush low-brass counterpoint. Some of the pre-teens fidgeted, while others gazed attentively towards the stage. Between pieces, conductor Dr. Eric Smedley faced the young audience to offer tips on what to listen for. Smedley gestured to the percussion section for a brief demonstration. “Can you show them the anvil?” A hammer-on-metal sound, imitating a blacksmith, filled the hall. After the band’s presentation—which contrasted older works with living composer Mark Camphouse’s “A Movement for Rosa”—the Salem Marching Lions paired off with members of the IU Symphonic Band according to their instrument, seated next to them for advice. Salem Middle School Band director Bonnie Harmon accompanied her students on stage. With three decades of teaching experience behind her, Harmon knew how to read her students well. “When I stood up there and asked ‘are you ready?’ They looked up, and I saw the whites of their eyes and knew they were very nervous,” she said before the side-by-side clinic. Aside from prepping the Salem Marching Lions for band invitationals and clinics like this one, Harmon is the newly-elected president of the Indiana State School Music Association (ISSMA) and co-president of the Salem Classroom Teachers’ Association. She said she feels lucky her community was chosen as part of the IU Center for Rural Engagement’s rural arts series. After Alain Barker of the Jacobs School of Music put her in touch with Ed Comentale, the director of IU Bloomington’s Arts and Humanities Council, she said the rest was history. “Ed asked if I’d be up for a concert by the Symphonic Band and a side-by-side clinic, and I went, ‘Oh my gosh, absolutely,’ Harmon said. On the clinic’s program was five short pieces that Harmon programmed for her band’s March 14 concert. Harmon said a single performance by a high-level group like IU Symphonic Band can make an unforeseen impact on her students. “This whole visit, simple as it is, is giving them new dreams. We’ve all had performances that change our lives like that—the first time you hear the philharmonic—it changes you,” Harmon said. The Indiana University Center for Rural Engagement improves the lives of Hoosiers through collaborative initiatives that discover and deploy scalable and flexible solutions to common challenges facing rural communities. Working in full-spectrum community innovation through research, community-engaged teaching, and student service, the center builds vision, harnesses assets and cultivates sustainable leadership structures within the communities with which it engages to ensure long-term success.